The Sandwich Fire Hall, located at 363 Mill Street in Windsor, Ontario, was built in 1921. The Fire Hall, one of the oldest in Windsor, has been recognized for its historical significance by City of Windsor By-law 155-1998. The Fire Hall, which is two-storeys high and composed of brick and stucco, also contains a hose drying tower and a stable, built in 1915. During operation, the Fire Hall housed two trucks: a 1930 Bickle pumper and a 1926 Gotfredson-Bickle ladder truck, which were later replaced by a Bickle-Seagrave canopy cab pumper and a 1941 Ford cabover engine. The original Fire Hall was designed by local architect Gilbert J.P. Jacques in a classical revival style. In 1941, a fire broke out in the building, damaging the majority of the second floor and the upper portion of the hose tower. The subsequent renovations, which retained the original design, introduced some extensive changes to the building’s exterior. The Fire Hall has some notable decorative features, including large, multi-paned windows; equipment entrance bays at the front of the building; and a pedestrian entry door, also located at the front of the building. The Fire Hall is near other significant heritage locations in the Sandwich area, including the Sandwich Post Office and the Mason-Girardot House. The building continued to be used as a fire hall until 1964. The building was then used as a detoxification centre until 2005, after which it was used as an art studio. More recently, it has been announced that the Sandwich Branch of the Windsor Public Library will be relocated to the Sandwich Fire Hall. CBC News. (2016). Sandwich Library will look and feel like a fire hall. Former Sandwich Fire Hall and Stable. (n.d.). Canada’s Historic Places. Hill, S. (2013, Dec 06). New chapter for historic fire hall; library plan welcomed in sandwich. The Windsor Star. Schmidt, D. (2012, Jul 12). 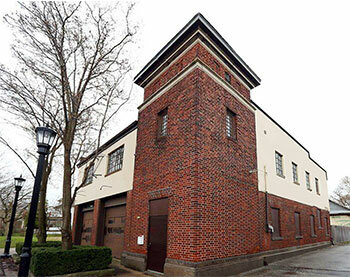 Historic fire hall gets reprieve; restoration of mill street building urged. The Windsor Star. Windsor Fire and Rescue Services. (n.d.) Fire Station No. 6.